Start Your Own Autoresponder Business! Automate all your follow-up with the VarPro Autoresponder Software! The VarPro Autoresponder System™ is a multi-user autoresponder system that was developed to meet the needs of internet marketers on the internet today! The VarPro System™ allows you to offer a service that you and other marketers desperately need… the ability to follow-up with your prospects and close the sale without spending a fortune doing it! VarPro™ will enable you, your customers, your downline and your members to manage and publish your/their e-zines, newsletters, update lists and more from your web site with unlimited autoresponders that can have unlimited personalized messages preprogrammed to go out per a schedule or you can send an e-mail your lists anytime. How Can The VarPro System Benefit Me And My Business? Do you currently pay for more than one or two autoresponders? Do you run your own newsletter or send followups to prospects manually? Do you have a downline you want to increase income from? Do you have a membership site you want to increase income from? Do you want to improve your relationship with your customers and site visitor’s? Do you want to take complete control of your e-mail marketing and customer followup? If you answered Yes to any of the above. Then The VarPro System can and will help you! What will the VarPro System™ do for You and Your Business? Allows multiple accounts with unlimited autoresponders and messages using your domain. Allows you and your clients to publish professional and personalized opt-in email messages. Allows you to sell autoresponders as a service or give accounts away. Start your own business, Give more value to your membership site! Allows you and your clients to stay in contact with clients and subscribers. Put your own e-mail marketing in overdrive on auto pilot! Saves you time. With features and automation so you do not have to work very hard! Sell more of your other products and services! Forget about ever paying for another autoresponder! Stay compliant with the Can-Spam Law! Personalized Autoresponders are an integral part of any online marketing campaign. They can become extremely expensive with ongoing monthly fees, especially when you need more than one. The VarPro System™ is a complete autoresponder hosting solution, an all in one server-side software application. With VarPro you can host Free and Fee Based Autoresponders on your web site. Start collecting Hard, Cold Cash… running your own paid service! E-commerce is responsible for billions in Internet sales! It is still growing and will continue to grow at an alarming rate. Products and services are being marketed and sold every second of the day on the Internet. The businesses and individuals behind the sales are using marketing tools and techniques to be successful. Do their tools include autoresponders? …They sure do! …Millions of autoresponders run every day! With the VarPro System™… Anyone can easily start their own online business, selling a high demand service …professional autoresponders! A marketing tool that will automatically send follow-up sales letters to your potential customers, plus newsletters, announcements and new product offerings to your existing and past customers. Are autoresponders used only for Internet marketing? Coupons can be sent for local area businesses …two-for-one specials, etc. Technical Support …provide technical information or manuals for products. And many more …the list is endless! These are just a few of the many hundreds of ways businesses and individuals are using autoresponders as a valuable and helpful tool. This is proof that a follow-up autoresponder will continue to be a high demand service! The people who use that demand to their advantage, will profit! We invite you to Take A Test Drive and feel the power of VarPro. Take a look at the Features that the VarPro System has! Get the VarPro System™ today! 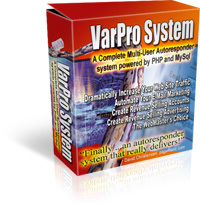 VarPro is truly an advanced autoresponder system …and specially designed with the webmaster and marketer in mind. We tried not leave ANY features out, but we made sure it was easy for anyone to use! Unlimited Accounts with unlimited autoresponders per account (admin sets the number). Ability to have an unlimited number of messages in each autoresponder. Supports Confirmed Opt-In and catches IP number of the person that confirms. No limits in software only limit is the hardware server is running on. Clients can ban e-mail address’s from their autoresponders. Subscribers can add their e-mail address to systems master ban list. Supports both e-mail or form subscription to activate autoresponders. All autoresponder e-mails can be personalized with over 100 personalization tags. Automatically inserts unsubscribe links in all out going e-mail from system. Built In Billing supporting PayPal, AlertPay, Authorize.net. Client Side Is Templated so you can edit to your sites look and feel, or language. Autoresponders can be set-up, accessed and modified 24 hours a day. Can set the from name and reply-to email address of out going e-mail from autoresponder. Can schedule mailings, and do a one off mailing (broadcast) to autoresponder list. Tracks unsubscribes, bounces and pending subscribers. Complete Web based Administration Control Panel. Supports “Automatic Account Set-up” …or administrator can also set-up accounts manually. “Full Personalization” in all administrative e-mails. Administrator is notified when an autoresponder account is set-up. Control multiple “Revenue Generating Ads” at the top of ALL messages sent from free accounts. Supports the ability to mail one or all account holders. You Get… Any and all upgrades to the software …free for ever! The VarPro System™ Really Delivers! …Feel The Power Of VarPro! This program is a must for any online marketer, Internet Service Provider, and a real treat for entrepreneurs looking to earn and save money! Just set-it up …and in no time you will have a large customer base of paying users. If you would like, you can Test Drive VarPro anytime and get a taste of what it’s like to use and administer a “Professional System”. Similar programs of this caliber sell for as much as $900-$5000! Although we know VarPro is worth hundreds more, we’re offering it at truly an unbelievable price! The VarPro System™ is a one-of-a-kind system and only available here at VarPro.com. Provide the service that “only a few others” are currently offering online! Cash in on the professional follow-up autoresponder market! Click Here to order VarPro System™, now!